Following the fantastic success of Whitby Pirate Day - now just completed its 6th year we have decided to bring the event to Stockton. 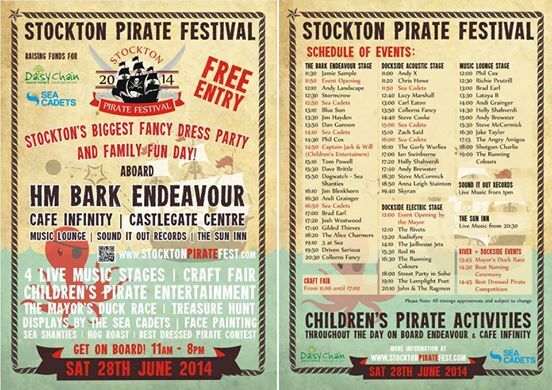 On 28th June 2014 we will be hosting the first ever Stockton Pirate Day on the Dockside & HM Bark Endeavour. We are partnering with Daisychain in Stockton on Tees to make this an annual fundraiser for the charity. 3 music stages playing local live music all day, bar, craft fair, café, barrel loads of pirates, children's entertainers and loads more We are looking to have a mini craft fair on the day, an electric band stage on the Dockside as well as an acoustic stage in the ship. The evening will see a pirate party in the ship with more music. Keep watching this space this one is going to be a blinder Aaarrgghhh! All information is from the official Facebook page .